At the age of twelve I decided that I wanted to work with animals and become a Vet so I became very focused on my goal and studied. I graduated with a Bachelor of Veterinary Science (Honours) from Melbourne University in 1977. After working for one year in Melbourne and then a second in a country practice, I returned to Melbourne late in 1979 to the Dandenong Veterinary Hospital where I worked for thirty-two years and over this time saw an increasing case load of fish, reptiles and birds. Having always had an interest in fish, I decided to follow it as a career by commencing in 1999 a part-time Masters in Aquaculture at Deakin University, Warrnambool. I completed it in 2004. In March 2003 I attended the Advanced Fish Medicine course at the University of Florida, USA. In June / July 2008 I sat and passed the examinations for Aquatic Animal Health for the Australian College of Veterinary Scientists (at this stage the highest level of specialized examinations for fish anywhere in the world). I am also an AQIS-accredited veterinarian for the preparation and inspection of companion animals for export. Commencing with the Melbourne Aquarium in September 1999, I now spend many hours working with fish and are one of the few veterinarians in the world who regularly performs ultrasound examinations on sharks. I was a key member of the team that performed the first Artificial Insemination on a shark in the world in July 2005. I have also been involved in the air transport of sharks to Japan and maintain regular contact with veterinarians at other aquaria around the world, including visits and providing advice. Some would say I specialise in sharks. Depends on to whom I am speaking with as to what description I use but shark wrestler always gets a laugh. I am also the consultant veterinarian to Aquarium Industries, the largest importer of ornamental fish into Australia. I have assisted in writing several government documents as part of the Australian AquaVetPlan program which relates to disease preparedness for aquatic animal diseases. I have been involved in the Aquatic Animal sector for the Australian Animal Welfare Strategy. I was married for twenty-three years until 2000 and during this time had six children. I married again in December 2004 to a beautiful woman who had three children from her previous marriage. We currently have four lovely granddaughters who we have a lot of fun with, and a grandson appropriately named Reef Jones. And a few more that we love to include. We live a complicated, busy, interesting and fruitful life and are very thankful for what we have. I am originally from Reading, Pennsylvania in the USA. My earliest childhood memories are all inspired by animals. Pretty from much from the day I started crawling I was in awe and chasing after any animal I came across. I developed a true love for ectothermic animals, and with the aid of my supportive parents grew a very large collection of tarantulas, fish, amphibians, and lizards. By the age of 15 my passion for herpetology took me to Australia, where I studied with frog expert Michael J. Tyler at the University of Adelaide during a school summer break. During this visit to Australia I developed a project examining the effects of pollutants on the embryonic development of frogs. This project received international awards at the Intel International Science and Engineering Fair, The Intel Science Talent Search, and the Stockholm Junior Water Prize. In 2003, I completed a Bachelor of Science in biology from Stony Brook University in New York. During this time I continued research throughout my studies and completed two internships at Merck Research Laboratories in Animal Pharmacology and was involved in researching nerve regeneration in zebra fish at Stony Brook University, which lead to a co-authorship in the publication Science. After completing my bachelor degree, I worked as a project manager for a start-up company that created customized educational software for university level science courses. After several years in the education industry, I missed being involved with animal work, so a career change was in order. In 2007 I received the Dr. Jerry Thornton Academic Scholarship and moved to Grand Cayman, Cayman Islands to attend St. Matthew’s School of Veterinary Medicine. After a year of study and lots of SCUBA diving the opportunity to move to Australia arose and in 2008 I returned to Australia to study veterinary medicine at Murdoch University in Western Australia. In 2012 I moved to Victoria and began working at Dandenong Veterinary Hospital as a companion animal doctor and surgeon and part time work with The Aquarium Vet under the guidance of Dr. Rob Jones. In 2015 I started fulltime with The Aquarium Vet. 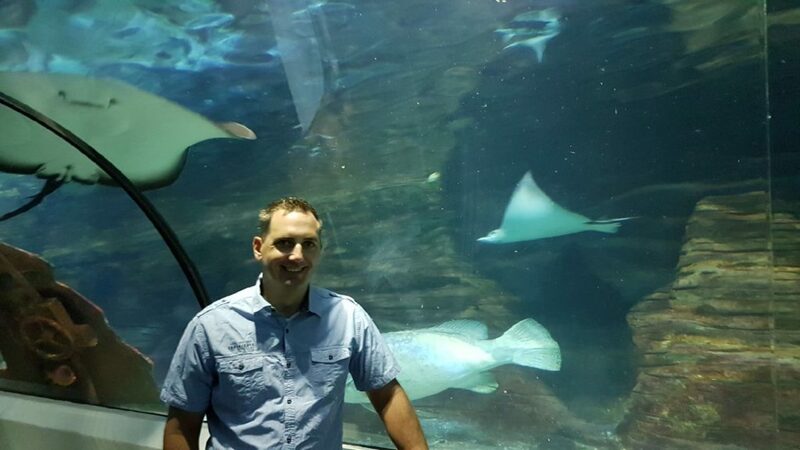 Most of my time is looking after the animals at Sea Life Melbourne Aquarium. However I keep busy in lots of other exciting areas such as elasmobranch artificial reproduction research, sea turtle rehabilitation, zebra fish facilities, and the E-Aquarist course just to name a few. I moved to Australia with my wonderful wife and our globetrotting canine companion, Luna, nearly nine years ago. In that time we had two children who are pure awesomeness and we now call Australia home. From a very young age I realised I had a real passion for the sea and its creatures. My fascination for sea life stemmed from my grandfather who was an avid sailor and fisherman. As a young child I had a bedroom full of aquariums which I would stock with small fish and invertebrates I caught locally. I studied Marine Biology degree at Flinders University in Adelaide, complemented by an Honours year investigating the growth rates of Green Lipped Abalone being fed diets containing various sources of protein. After graduating I worked in various aquaculture farms from Barramundi to Mussel farms. In mid 1999 as the Melbourne Aquarium was nearing completion I was successful in obtaining a position as an aquarist. Being involved in the start up of a large public aquarium was a fantastic experience during which time I learnt much about fish health, husbandry, transport and life support systems. In my nearly six years at MAQ I successfully achieved the role of senior aquarist. Working with Dr Rob Jones at MAQ rekindled my interest in becoming a vet, so I successfully applied to the University of Quenslaand. During my veterinary studies I worked at UnderWater World as senior aquarist. In late 2009 after graduating from Vet school I worked in a large busy mixed practise veterinary clinic. Soon after graduation I started to consult to Underwater World. In 2015 I started up my own consulting business, following my passion of fish vet work. I had the exclusive contract for the veterinary care of all animals for Sealife Mooloolaba, I also worked with many fish collectors and breeders. I live with my partner of over 20 years and our two beautiful daughters. On my days off you'll find me spending time with my family, or if it is windy, racing about Moreton Bay on my windsurfer, often competing in the Bayside Sailboard Club. In late 2017 I was very excited to be offered a veterinary role with The Aquarium Vet to start early 2018. I look forward to meeting you and helping with all your animal health enquiries. For now, I am a human being, that likes travelling to visit our students and the many amazing aquariums in the world. 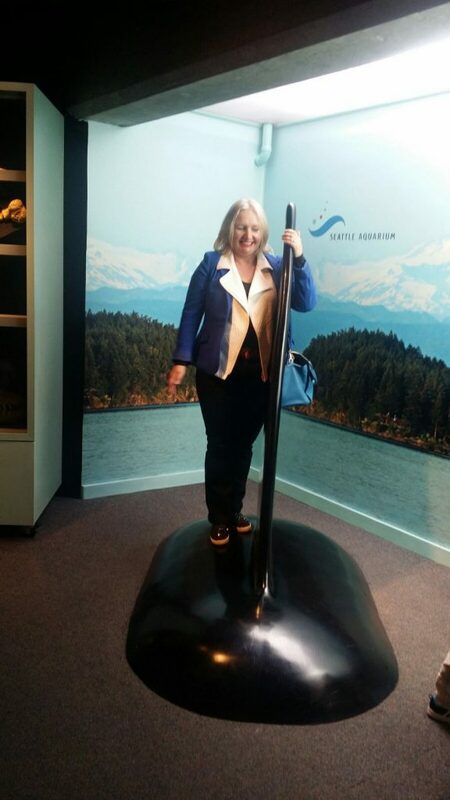 Here I am at the Seattle Aquarium in 2016. Lots of fun. We then went to the San Juan Islands and saw orcas in the wild. A great experience!